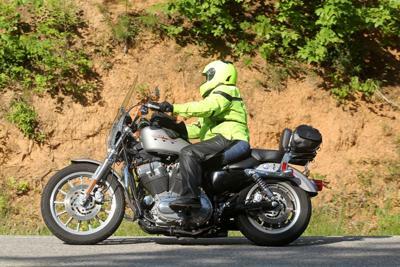 This is my 2007 Harley Davidson Sportster 883L. After riding two up with my husband for years, I stopped. I was afraid because we had gained weight, and I knew we were exceeding the safe weight for the bike. I finally decided to take a rider safety course (he took it with me, and learned that he was doing some things wrong!!) and I had a ball. However, it took me several months after taking the course to pull the trigger on purchasing my own bike. See, I had fun during the course, but I knew I was safe...we were in a parking lot, never doing over 20mph and the only risk was dropping the bike and embarrassing yourself. I was afraid of getting out onto the open road. A word about my gear...I had seen the dayglo yellow jacket in a BMW store and I kidded my hubby that if I ever got my own bike, I wanted that jacket!! I was nervous, and afraid of the possibility of an accident on the road and wanted to be visible. Eventually, though, I swallowed my fear and purchased my first bike at the age of 42 - a Kawasaki Ninja 250 Once I got out on the road, I was in LOVE! A week later, the dayglo yellow jacket was waiting for me when I came home from work!!!! About a month after that, having seen how visible I was when out riding together, my hubby purchased the same jacket for himself. After about a year really learning to ride and practicing my skills, I was ready to begin to go on road trips with my husband. However, I did not feel comfortable taking the 250 on the interstate, so it was time to upgrade. So we shopped. I had kept a HD brochure on my bedside table for several weeks opened to the picture of the Sportster, which based upon my 5'2" frame seemed like would be a good fit for me. It was late on Saturday, Labor Day Weekend, 2008, when we walked into a HD dealership and there she was...exactly as I had seen her in the brochure - even the same color! She was used, about a thousand miles on her (the Ninja I traded had 1000 miles on her too), but as soon as I test rode her, I knew that this was MY bike. We made the deal and I rode her home. The next day, we took off...my husband on his Kawasaki ZZR1200 and me on my Sporty - daughter in her little car. We rode to Alcoa, TN to spend the night. My husband had told me about this great road - the Cherohala Skyway - and as we sat at dinner that night, I said I would like to go there. He looked at me and then down at the map, and told me that the only way to get there from where we were was to go through Deal's Gap. I freaked out. I've seen that road on YouTube....I know it's rep. I'm scared again. I CANT RIDE THAT ROAD!!! On a bike I just bought yesterday?!? Who are we kidding?!? But the next morning, I said to him that I would follow wherever he lead. If it meant going through the Tail of the Dragon, so be it. I just didn't want him to tell me the route ahead of time. At some point during the day, I found myself winding through curve after curve after curve. This has got to be it, I told myself...and the next thing I know, I am laughing my head off. I am a RIDER - and I am NOT AFRAID!! Who would have believed it? Sure enough, soon after we are having a coke at the Deal's Gap Lodge. My Sporty, my husband, and I have logged over 10,000 miles now. I have had some spills, and some broken bones. I have ridden in the rain and the wind. I have seen beautiful countryside, met great people, eaten great food and spent wonderful quality time with my husband. I have added a dimension to my life that would never have happened if I had given into the fear. My only regret is that I didn't learn to ride my own sooner!!! I loved your story, thanks for sharing. I have had this secret desire to ride my own bike for some time now, however I'm scared to death. After reading your story I'm inspired to put my fear behind me and take a class. Happy trails! Congrats Steph for taking life by the handlebars and riding your own! My husband and I have logged many miles together since we married in 2002. I knew how to ride when I met him but had never rode a street bike. 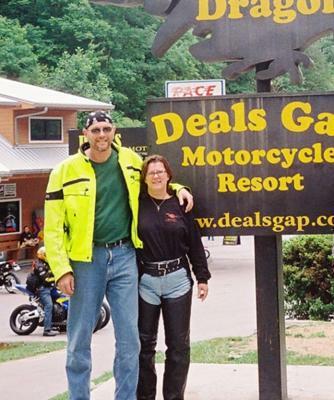 He had a Honda ACE and we quickly got rid of it due to electrical issues that arose just before our 1st 2-up trip to Tennessee(we live in IL)so we rented a Harley Davidson Road King. We wound up buying a Low Rider and I took the MSF course. Got my 2003 Sportster and I was riding everywhere. We went to Sturgis and Yellowstone the next year. I traded her in on a 2006 Super Glide in 2008. I love to ride and mentor new women riders. Hope you have many safe travels! Wow, an amazing story ...!! Thanks, ladies, all for your comments!!!! Keep the shiny side up!!!! Thanks for sharing your great Story, Steph! You were tested right from the start! I love your neon helmet & jacket! Your story uplifts me!! Keep riding, be SAFE and thanks for Sharing! No longer living in Fear! What a great story/ride. And boy..........aint your husband bloody tall!! I agree with the bright yellow jackets too. I started at age 50, three years later I have 27,000 miles under my boots! Love the Dragon and Big Sur! I wear the loudest colors I can. The guy that pulled out in front of me said he couldn't see me, which was a crock. So no one can ever say that again. Fantastic. Sorry about the broken bones, that's no fun, been there, done that. Got in a wreck 2 yrs ago, a guy pulled out in front of me, result, crushed leg & broken wrist. Took about 9 mos to get back to work. While healing went out and bought a Honda Shadow 1100, love it. First time on the road was in SD, Black Hills. 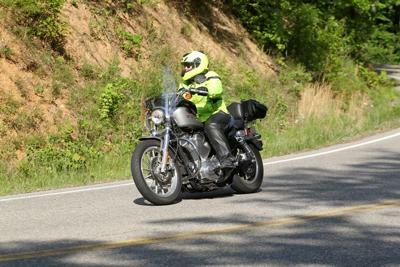 That was last June, went back this year and rode the Iron Mountain Rd, great ride. Planning to do Deal's Gap soon, can't wait. Never too old, I'm 61 and enjoying keeping the rubber on the road. We've put over 4000 miles on our bikes in 1 yr.
Planning to put on a lot more. Enjoy and never give up. I know how you felt on that curvy road for the 1st time. On my 3rd ever street ride, my riding partner lead me up CO72 to Evergreen CO, and back down again. Later that night I looked at the route on a motorcycle road-map and saw that it was highlighted in red, meaning experienced riders only. I just rode like the instructors told me to, and it worked out fine.